Fructose 1,6-bisphosphate, also known as Harden-Young ester, is fructose sugar phosphorylated on carbons 1 and 6 (i.e., is a fructosephosphate). The β-D-form of this compound is common in cells. Upon entering the cell, most glucose and fructose is converted to fructose 1,6-bisphosphate. Compound C05345 at KEGG Pathway Database. Enzyme 2.7.1.11 at KEGG Pathway Database. 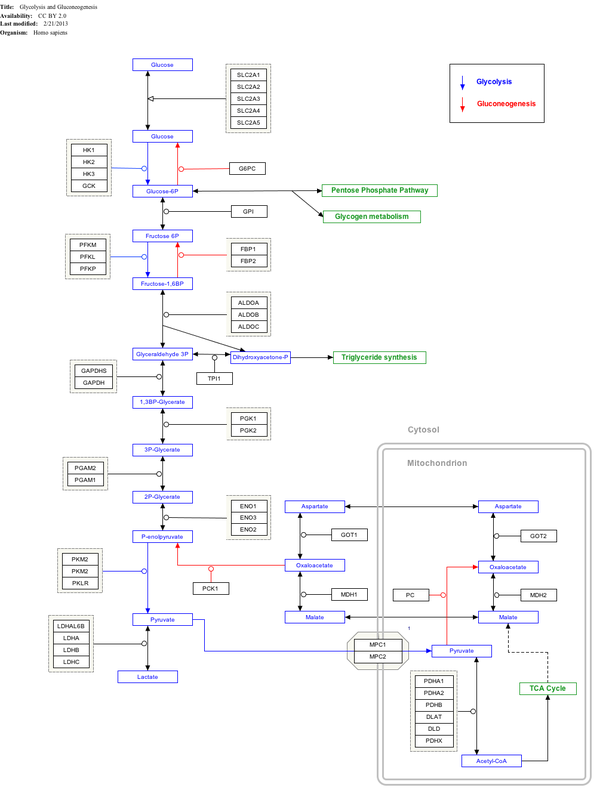 Enzyme 3.1.3.11 at KEGG Pathway Database. Compound C05378 at KEGG Pathway Database. Enzyme 4.1.2.13 at KEGG Pathway Database. Compound C00111 at KEGG Pathway Database. Compound C00118 at KEGG Pathway Database. Fructose 1,6-bisphosphate has only one biologically active isomer, the β-D-form. There are many other isomers, analogous to those of fructose. Fructose 1,6-bis(phosphate) has also been implicated in the ability to bind and sequester Fe(II), a soluble form of iron whose oxidation to the insoluble Fe(III) is capable of generating reactive oxygen species via Fenton chemistry. The ability of fructose 1,6-bis(phosphate) to bind Fe(II) may prevent such electron transfers, and thus act as an antioxidant within the body. Certain neurodegenerative diseases, like Alzheimer's and Parkinson's, have been linked to metal deposits with high iron content, although it is uncertain whether Fenton chemistry plays a substantial role in these diseases, or whether fructose 1,6-bis(phosphate) is capable of mitigating those effects. ^ Ishwar, Arjun. "Distinguishing the Interactions in the Fructose 1,6-Bisphosphate Binding Site of Human Liver Pyruvate Kinase That Contribute to Allostery". Biochemistry. 54: 1516–1524. doi:10.1021/bi501426w. PMC 5286843. ^ Bajic, Aleksandar; Zakrzewska J; Godjevac D; Andjus P; Jones DR; Spasic M; Spasojevic I (2011). "Relevance of the ability of fructose 1,6-bis(phosphate) to sequester ferrous but not ferric ions". Carbohydrate Research. 346: 416–420. doi:10.1016/j.carres.2010.12.008.